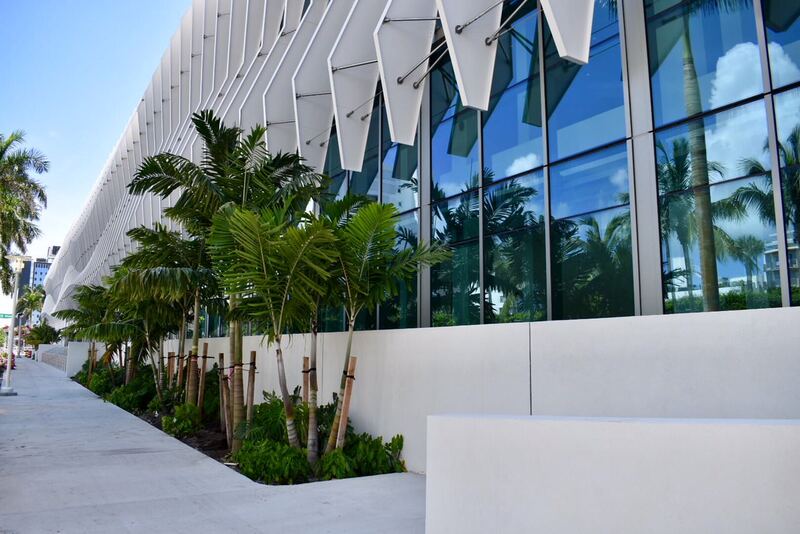 After nearly three years of construction, the Miami Beach Convention Center is almost complete. Completion will allow for the start of construction of a new 5.8 acre park being built as part of the project, on what is currently a construction staging area. Opening of the park is now scheduled for June 2019. Construction on the convention center began in December 2015. The contractor now says that substantial completion is set for October, two months later than originally planned. The delay will not affect any shows, including one set for September, according to Re: Miami Beach. 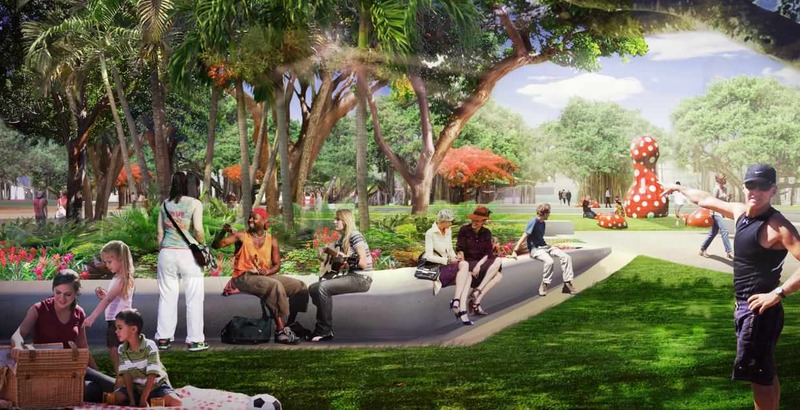 Landscape design of the new park and the areas around the convention center is by international landscape architect firm West 8. Photos this week show that palm trees have already been planted around the building. Hah. I didn’t even know this project was approved. Looks great. Saw it up close and personal the other day… completely different place… looks fantastic. What we got is typical Arquitectonica yawnware. Another glass box with a lazy gimmick stuck to the side. Going to the Miami International Auto Show in October. I think the Miami Int’l Auto Show is in November. Uh no, its in October. Look it up. Any news on the Fillmore? Will be it renovated too? This new convention center makes me feel like i do when i think about the Marlins or Beckham new plan, like it was/is a scam, bait and switch. I will vote no for the hotel this fall and feel like the city could have gotten a lot more from the original proposal w/ hotel, park, parking, before Levine came in and ruined it (and maybe lined his pockets). The other plan was a lot better – I am glad hopefully roads will open soon, but now mcarthur is a mess and its not even because they are building light rail which Levine was against… whatever. The lack of shade trees in the majority of the park is such a disappointment. Umm, article states the landscaping is still pending. The design was significant changed for Art Basel related shows. Correct, you can find the landscape plan in a previous post I believe. Banyan trees have shallow root systems. A more hearty, native species would be better in the long run. Seriously TNM you allow these type of comments on your website?